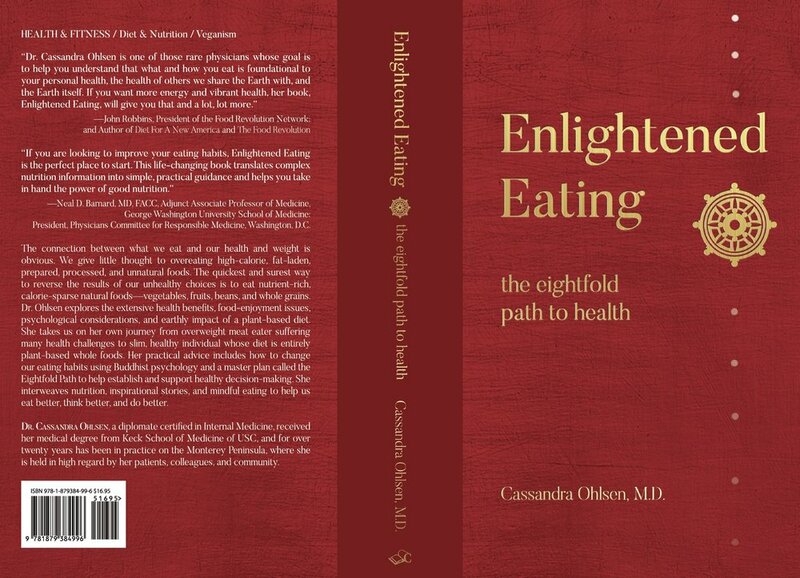 Dr. O's New Book — Cassandra Ohlsen, M.D. —Neal D. Barnard, MD, FACC, Adjunct Associate Professor of Medicine, George Washington University School of Medicine; President, Physicians Committee for Responsible Medicine, Washington, D.C. The connection between what we eat and our health and weight is obvious. We give little thought to overeating high-calorie, fat-laden, prepared, processed, and unnatural foods. The quickest and surest way to reverse the results of our unhealthy choices is to eat nutrient-rich, calorie-sparse natural foods—vegetables, fruits, beans, and whole grains. Dr. Ohlsen explores the extensive health benefits, food-enjoyment issues, psychological considerations, and earthly impact of a plant-based diet. She takes us on her own journey from overweight meat eater suffering many health challenges to slim, healthy individual whose diet is entirely plant-based whole foods. Her practical advice includes how to change our eating habits using Buddhist psychology and a master plan called the Eightfold Path to help establish and support healthy decision-making. She interweaves nutrition, inspirational stories, and mindful eating to help us eat better, think better, and do better. Available online, at libraries, and your local bookstore.